Nas may have told us recently that "Hip Hop is Dead", and this wouldn't be the first time in its life the rap game has gone through an identity crisis. And it won't be the last for sure. Over the 30 years of Hip Hop on wax, there have always been times when trends have been followed, and the music has taken a new turn. Sometimes its listeners were all for the change, sometimes not. But Hip Hop is always evolving and just when you think the music becomes played out and has reached it's lowest ebb, a phoenix will rise from the flames. Rap started out on wax influenced mostly by Disco, quickly followed by electro beats, the ROLAND 808/909 era, and phases such as the stupid fresh days, james brown samples, afrocentric rhymes, jazzy beats, blunted beats, the indie years, backpack raps, etc. the list goes on. In fact you could say Hip Hop is an innovator of many styles, often leaving behind its musical legacy, and taking on a new form no longer understood by the masses. By doing this it becomes revived and fresh once more! Unfortunately at the moment the industry beats and rhymes are as far from true Hip Hop as they could be....but never say die! 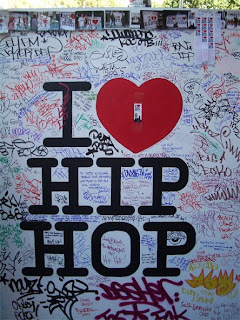 Hip Hop will be reborn. Just as before. Here's an appropriate joint to help us keep the faith! 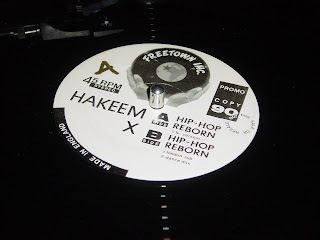 Hakeem X was born J.A. Benton in NYC in 1971, and at an early age has a successful modelling career as well as appearing in two TV adverts with legendary comedian Bill Cosby. At age 10 he wrote his first rhymes, and by the age of 14 producing demos with Dr Freeze and DJ Ross. "Hip Hop Reborn" was mixed by Rod Hui and Eric "Vietnam" Sadler of Public Enemy fame.